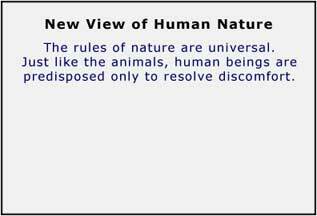 Only one view (theory) of human nature has ever been considered by the media, academia, the public, the judiciary and Congress. The accepted view (theory) is summarized here. Follow us as we build and contrast opposing views (theories) of human nature. We will build each view of human nature by adding one new idea at a time until each respective view (theory) of human nature has been developed fully. Our work at SpringGravity.com is based on a new science called Humanology®. The link in the menu to the left labeled “The Science” provides information on its core theory. The theory central to Humanology® explains how emotions and other inspirations work in animals and human beings. Understanding how emotions and other inspirations work leads to the discovery of another view of human nature. 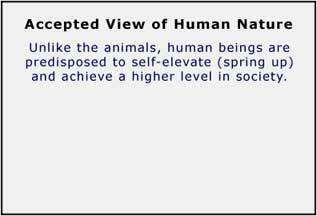 This newly discovered view (theory) of human nature is summarized here. Again, follow us as we build and contrast opposing views (theories) of human nature. We are building each view of human nature by adding one new idea at a time until each respective view (theory) of human nature has been developed fully.